The lines of the creation-evolution debate are boldly and firmly drawn and few plausible arguments have been made that carve a promising path forward. 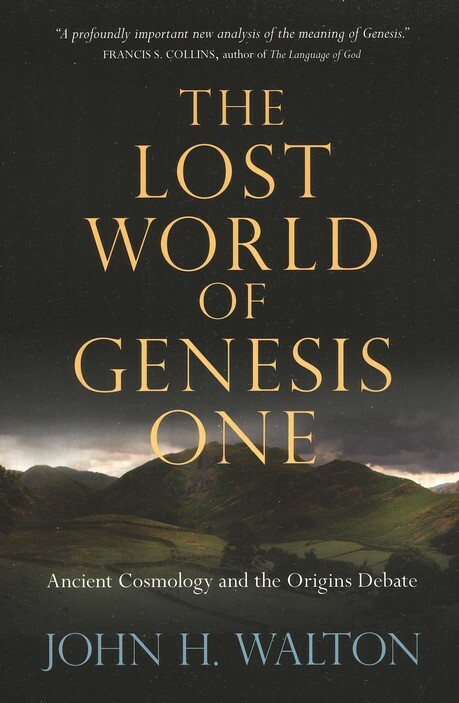 But with The Lost World of Genesis One: Ancient Cosmology and the Origins Debate (Kindle edition), John H. Walton provides just such an argument. Professor of Old Testament at Wheaton College, Walton’s evangelical credentials are substantial. In this book, he offers a reading of Genesis 1 that aims to take seriously both the trustworthiness of scripture and the original intention of the biblical author yet does not commit him to the view that the universe was created some 6,000 or so years ago. The thesis of the book is that Genesis 1 is not (nor was it ever intended to be) an account of the material origins of the universe. Instead, he argues, it was intended to be an account of the functional origins of the universe. That is, Genesis 1 is not about how or when God made the stuff of creation but about the function God intends for the created order. This distinction will be very challenging for modern minds to grasp, if only because the notion of creation has primarily to do with the creation of materials. Walton argues, however, that ancient near eastern people understood the concept of creation in a very different way; namely, they thought of creation in terms of its God intended function. This is not to deny that God made all things or that he made all things out of nothing. No ancient Hebrew would deny that. It is simply to say that Genesis 1 is not about the creation of the material world. And, Walton insists, an ancient Hebrew reader would never have thought it was. So, what does it mean that Genesis 1 is about the creation of the functional origins of the cosmos? Walton argues that the creation narrative in Genesis 1 was intended to be an account of how God established the functions of his cosmic temple. That means that God intended the creation, which he had already made at a previous and undisclosed time, to be his own personal dwelling place, his own temple. And the events on the six days of creation are his work to establish the functions proper to that sacred dwelling place, not least the climactic moment when those who bear the divine image are placed within the temple. The reason this book is so important is simple: if Walton is right, then Genesis 1 makes absolutely no comment on the present day creation-evolution debate. Evolution is about the material origins of the universe; according to Walton, Genesis 1 is about the functional origins of the universe. To suggest that Genesis 1 provides an alternative account of the material origins of the universe against evolutionary theory is simply to make a category mistake. Genesis and science are making statements about two altogether different matters. Walton’s contribution is to give us a serious and literal reading of Genesis that does not contradict modern science. Throughout this book, Walton insists that he is firmly committed to the truthfulness of Genesis 1 and the original intent of its author. Unfortunately, I suspect many committed to a young earth may write Walton off as compromising scripture for the sake of science. To do so, however, will be a failure to take seriously the argument he is advancing. Indeed it is Walton’s obvious love for scripture and his conviction that it speaks truly that led him to produce this interpretation that values so highly the authorial intent of the Bible. One may argue with his exegesis, but no one should suggest that he is not taking the text of scripture seriously. Quite the page turner, this book is compelling both devotionally and academically. And if you are one of the many who struggles because you hold a high view of scripture and yet find many theories of modern science compelling, then this is the book you have been waiting for. You won’t be able to put it down.